You don't need to press a button and you don't need to plug it in, either. All you need are: medium grounds, water, a flame, and a moka pot. Despite all the technological advancements that we have today, sometimes the best way to get something done is to do it the traditional way. In this case, the best way to make a cup of homemade espresso. Just because this isn't the 'modern' way doesn't mean it's painfully slow and complicated to make espresso. With a moka pot, you can have 6 2oz cups in five minutes. Cleaning it is simple, too. Just rinse it with water. 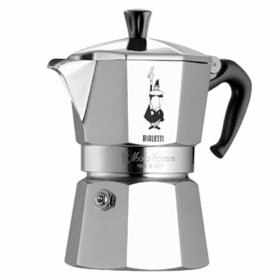 The best part is, this will last you a long time; just as moka pots have stood the test of time all these years.